Congratulations to Illinois Tech’s Ethics Bowl team members for their dedication and teamwork this semester, and an incredible performance at the Upper Midwest Regional Ethics Bowl at Illinois Tech on November 17. The team competed against 29 other teams from 20 schools across the Midwest, answering questions from a panel of judges about a collection of cases the students have been discussing since the beginning of the semester. The Illinois Tech team members who competed on Saturday are Sarah Davila (CAEE 1st Year) and Antonio Archilla (CHBE 1st Year). The team had support from their fellow team members of QED: The Ethical Debaters, who helped in preparing and running the event. 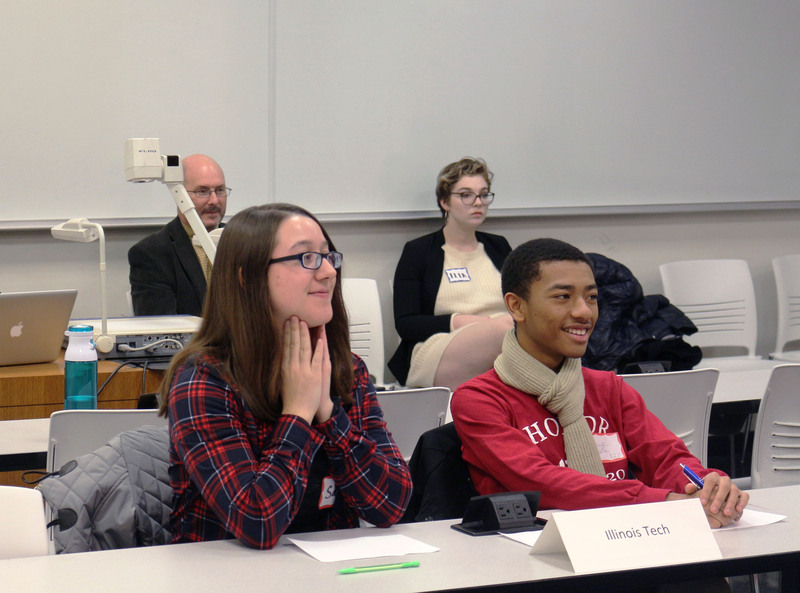 The Intercollegiate Ethics Bowl is an academic competition with rules and procedures designed to model the best approaches to reasoning about practical and professional ethics. Created and developed by Illinois Tech Philosophy Professor Robert Ladenson, the IEB has spread to include well over 150 teams from all over the United States and Canada. QED: The Ethical Debaters is a club dedicated to discussing current ethical topics in the news and has a number of events planned for next semester, including movie nights, guest speakers, and mini ethics-bowl competitions. If you are interested in learning more about QED, please visit the HawkLink page or join the Google Group at iitethicsbowl@googlegroups.com.